Secular bull? Or bear about to do its thing on “unsuspecting” market players? These are questions making serious rounds on the world wide interlinking-web. That’s because fear sells and nothing gets eyeballs and clicks for the user-ravenous financial sites like some market-topping bear talk. If you were alive and investing in the 70’s, or like myself, have read up on the stock market action of the 70’s then one can see how similar the two time periods seem to be acting(at least in the S&P 500). Don’t worry, I’m not about to hit you with yet another comparison chart of some calamitous US financial event laid over current action. Instead, I’d like to share some work by Lance Roberts. For the record, I like those comparison charts but I also take them for what they are…entertainment. At best they’re another useful input and at worse they’re just noise. If you’re unfamiliar with Mr. Roberts, he consistently writes compelling market pieces. I happen to think he’s one of the more under-appreciated financial commentators on the web right now. He’s the co-founder and general partner of STA Wealth Management. Earlier in the year, Mr. Roberts shared some graphs comparing current times to the secular bull formed in the 80’s and the fakeout in the 70’s. At STA they definitely have Austrian economic tendencies in their communications regarding the markets, and so obviously can lean toward a more bearish stance at times. Or as other Austrians call it, just being realistic in light of all the economic data readily ascertainable. They have significant assets under management of approximately $500 million to $600 million, so these guys are the real deal. Specifically, they focus on the client who possesses low six-figures to approximately $5 million in capital, so they’re not exactly whale hunters. STA feels that market is an underserved niche of wealth management. I’m not trying to plug their services nor do I have any relationship with their firm. Like other commentators or service providers I include in my posts here at MarginRich.com, I’m fairly certain STA doesn’t even know this blog exists. I just want to share with my readers another financial blogger whose work I really enjoy. You can also find work by Lance Roberts at Advisor Perspectives, home of dshort. Now back to the charts Roberts shared in January. 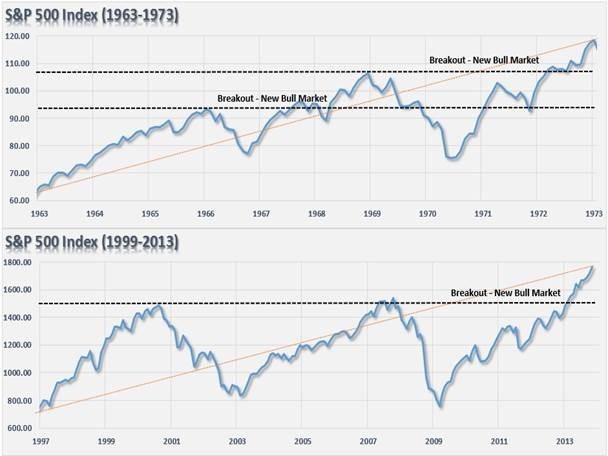 The first one shows a direct comparison of the current period to the false breakout of the late 60’s into what looked like a new bull going into 1973. As we all know, The recession starting in 1973 was one of the worse times to be in the stock market in its history. The next chart shows the S&P’s performance and the realization of the false hopes for investors during those time periods. Sorta looks like the decade of the Oh-Oh’s, except the action up to 1973 produced higher highs. As opposed to what we experienced in 2000 and 2007 in the S&P 500 with virtually equal tops. The reason for that was obviously all the capital was pouring into the NASDAQ in 2000. Moving on to the last chart. Roberts shows the total picture with the final washout in 1981 and the true beginning of the 18 year mega-secular bull market that helped to explode the growth of the mutual fund and retirement investing industries. Of course there were up’s and down’s during the real secular bull, but boomers blessed with the easiest time to make buy and hold gains during peak earning years helped to build the academic case of always investing in stocks for the long run. Not that I want to get into any philosophical debates on investment strategies or the level of difficulty of investing through the 80’s and 90’s. I use the term “easy” through the lenses of hindsight. The point of sharing these charts is to increase awareness that this 5 year run that America has been on off of the 2009 lows, may not be the start of a real secular run like we saw from 1982 to 2000. In 1982, the conditions were more like a final “cleansing”, so to speak. The new CEO of America was instilling a lot of genuine hope and assuaging genuine fears with genuine actions, not lies or baseless rhetoric. Valuations were exceptionally low with single digit P/E’s and very enticing dividend yields across the market. Price inflation had been beaten back by the last semi-responsible Fed head. Simply put, these are not conditions that exist today. In fact, the exact opposite of each of those conditions exist today. I understand that the music is playing but do you want to keep dancing? Conditions are decidedly different due to deep distortions across the financial landscape. But hey, I’m only one voice of many and if you’re one of plenty of people(including professionals) who think we’re in the midst of a secular bull market, then by all means keep putting new money to work. However, even if you’re dollar cost averaging and you don’t believe in “timing” the market, now may be a time to build your cash levels. Don’t just take my word for it. In a previous post I cited some thoughts shared by Seth Klarman and Jeremy Grantham. They each communicated their fears of the frothiness of these markets but that the markets will continue to move higher before an inevitable bust. Now the inimitable Howard Marks has essentially shared the same sentiment in his latest Memo From Our Chairman. Collectively, these 3 gentlemen help oversee more than $200 billion in assets under management. In addition to their combined multiple decades of experience, their respective savvy has made each of them billionaires. Now if scions of the investment world such as these fellas are telling you to be cautious, do you really want to be the rebel without a cause out there allocating your capital based on the premise that trees DO grow to the sky? Look I know the path of least resistance for the markets is up and I’ve reinforced that in previous posts. It’s just that based on the distortions, it really feels like a reckoning is coming. And just some basic cycle research yields a time table of approximately 12 to 24 months from now for some potentially tough times as an investor. I’m not talking about exiting the markets entirely. I’m talking about raising cash levels to be prepared when the real values potentially present themselves and minding your stops. Next time I’ll share some hopefully enlightening charts and thoughts on those aforementioned distortions.